(Advertisement) It was a spectacular winter’s day in Potsdam when we climbed on top of one of the two observatory towers of the Belvedere. The air was clean and clear, the breeze soft and warm, the skies were blue. Below us, there was one of the prettiest 360-degree panoramas one could have. Not only were we greeted by views of the city of Potsdam on this fine and sunny day, we could even see as far as Berlin. The Belvedere on the Pfingstberg in Potsdam was designed by King Friedrich Wilhelm IV. as a maison de pleasance. There was just one particular aspect that made the Belvedere so special. It was certainly not the Italianiate style of architecture, because that was a shared feature with many other buildings in Potsdam. 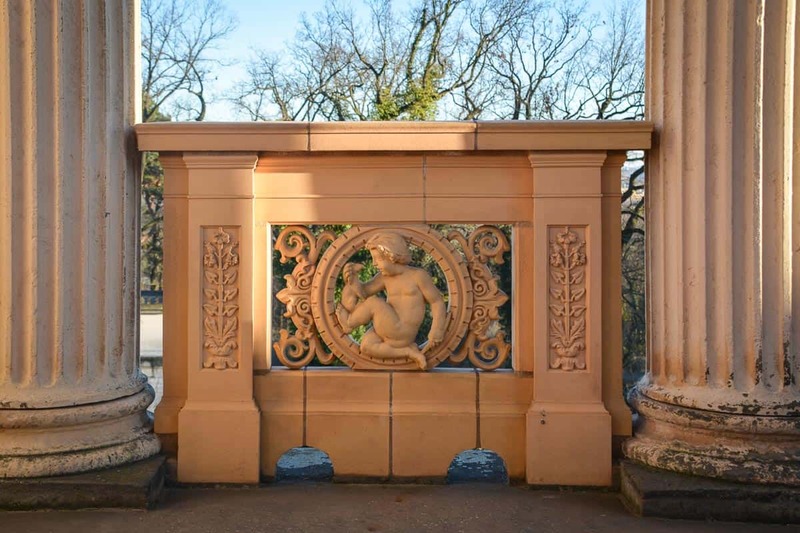 It was also not the gardens surrounding the palace, designed by famous garden architect Lenné who had left his mark on several projects around town. Neither was it the skillfully reconstructed interiors of the Belvedere since there weren’t a lot of interior spaces here to begin with. It was rather one thing which would have excited many real estate agents in Sydney: Location, location, location. The location of the Belvedere on the Pfingstberg in Potsdam has always been both, a blessing and a curse. It was this main aspect which had had huge influence on the fate of this extraordinary building. Firstly, it was indeed the beautiful location on top of the Pfingstberg mountain that had given birth to the idea of a maison de plaisance like the Belvedere in the first place. The amazing views one could enjoy when standing on top of a tower on the summit. But then it was also due to this unqiue location that the Belvedere had almost been doomed. During the Cold War era, the ensemble had been located so close to the German-German border that East Germany considered it a threat to national security. But then was it also thanks to this special location that many Potsdamers felt that something needed to be done to save the building from complete ruin. It was thanks to their hard work and lobbying which helped keep the palace open for future generations. The design of the Belvedere is following typical Italian patterns. This lightness and playfulness gives the palace a sunny appearance even in the cold winter months. It was the Prussian king Friedrich Wilhelm IV. who had selected the Pfingstberg mountain in Potsdam as a befitting location for his new Belvedere. His plan had been to build a summer palace which would offer many options for leisurely strolls. The plan included for example elaborate water features, which would see the waters of the river Havel tumble down the Pfingstberg mountain. A dream of Italy, inspired by the grand Italian villas which the king had seen on his trip to the south of Europe. 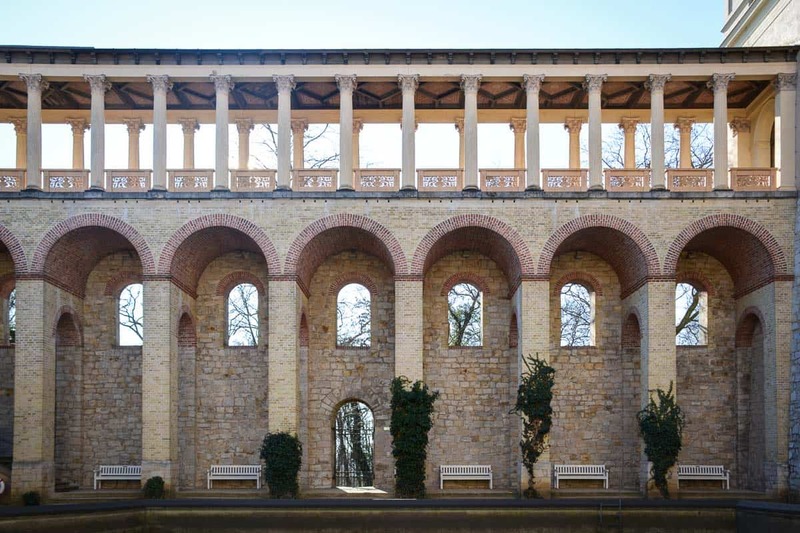 The first works began right next to the small Ponoma Temple in 1844, a temple which had been built by famous garden architect Schinkel a couple of years earlier. Two parallel colonnades were finished as well as a connecting closed wing in the north. Two oberservatory towers were added. A huge reflection pool in the enclosed inner courtyard became a focal point. But then, for various reasons the construction works came to a halt. In the end, the exciting plans never became a reality and a trimmed down version was the final result. High protective walls with openings enclose the inner courtyard with reflection pool. They create a close connection to nature on the other side. Even though today’s building was just a fraction of the king’s vision we still couldn’t negate the extraordinary magic of this place. On this bright winter’s day the colonnades gave off a warm, golden glow. The playfullly carved ballustrades casted ornate shadows of swirls and patterns onto the patterned floors. Behind the windowless openings in the exterior walls of the courtyard the naked winter trees moved their chocolate brown twigs. The atmosphere in the patio was that of a protected freedom, the lookout terraces on the upper levels were airy and sunny. 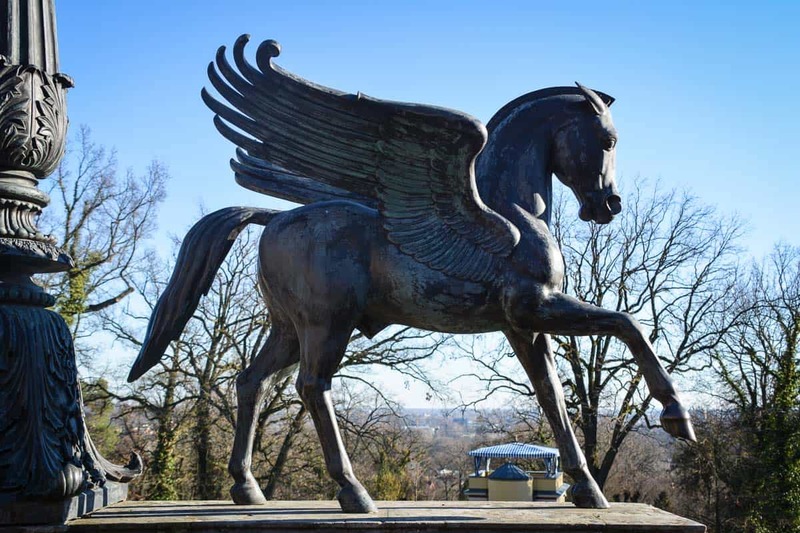 Two original copies of the famous pegasus statues greet today’s visitors to the Belvedere in Potsdam. The king didn’t really get a chance to enjoy his new Belvedere. Soon after its construction it was opened to the public instead and it became a popular day trip destination for the locals. Some decades later, the aftermath of WWII almost meant the end for the ensemble. Potsdam came under Russian control, the Belvedere with its location just behind the inner German border now was off-limits for well-behaved East German citizens. The buildings soon started to deteriorate, columns and walls were taken over by vegetation, stairs were removed to discourage break-ins, an ugly gate with Russian graffiti blocked the entrance. Thus, one of the most enchanting buildings in the GDR turned into a Sleeping Beauty, and all of this just because of its unfortunate location so close to a militarised zone. The regime feared that citizens might climb the observation towers to spy on the border installations. With a heavy heart, the locals watched how the Belvedere slowly but surely turned into a ruin. No longer able to sit still and just let things happen, they (rather bravely) founded an initative with the goal of stopping further deterioration and damage to the buildings and the surrounding gardens, suspiciously watched by the secret service. The proximity to the inner German border during the Cold War had been a security risk for the GDR which is why the buildings were left to deteriorate for many decades. This initiative was turned into the Förderverein Pfingstberg in Potsdam e.V. which is today still looking after the running and the maintance of the building. In a painstaking effort they did not only manage to maintain the palace and the gardens, they have also reconstructed in astonishing detail every part of the ensemble that was still reconstructable. The group have collected donations to fund their work, many of which had been given by prominent private investors. Today, the maison de plaisance is once again open to the public, and in summer it is a popular Potsdam venue for concerts, exhibtions, and events. One of the observation tower rooms is also an attractive wedding ceremony venue. 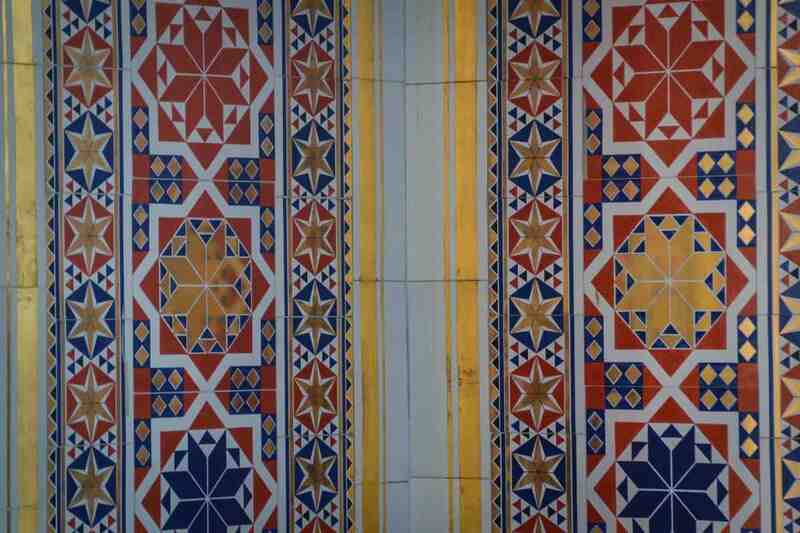 Just ten original tiles could be saved by the Förderverein. You will need a keen eye to detect those between the exact replicas used in the wedding ceremony room. So now we were standing on top of one of the two towers which weren’t meant to be after all these years of neglect. Today, a modern custom-made spiral staircase led to the roof of the tower but just a couple of years ago there had been nothing more than a gaping hole. Rain water had seeped through the roof and caused massive damage to the fresco walls of the room below. Vandals had knocked out the gold-leaf tiles on the walls of the Moorish room in the other tower. But these signs of destructions were long gone now. Today, the ensemble was perfect again, inviting us to direct our gaze to what was beyond, the beautiful panorama of Potsdam. Along the sides of the roof we could read the names of the sights around us engraved into a metal bar. On the Berlin side we could make out the Teufelsberg. There was the Berlin TV tower in the distance. We could even see the Olympic bell tower. From atop of the Belvedere you can see for several kilometres. One of the sights that are clearly visible on good days is the old US radar station on the Teufelsberg in Berlin. Looking to the other side we could see many of the Potsdam attractions such as the great dome of St. Nicolas’ Church, Babelsberg Palace, Glienicke Bridge and the sails of the windmill at Sanssouci. Since it was winter the trees were still naked, so that we had clear views of what was just below. It was almost as if we were enjoying x-ray vision of Potsdam, and as if the city was presented to us naked and as pretty as it has always been. Visitors to the Belvedere on the Pfingstberg can expect marvellous 360-degree views of Potsdam and Berlin. The Belvedere on the Pfingstberg and the Pomono Temple are today owned by the Stiftung Preußische Schlösser und Gärten Berlin-Brandenburg and is managed by Förderverein Pfingstberg in Preußen e.V. This article reflects my personal experiences which I could gather during a press invitation. Unfortunately, the observation towers are normally closed during the winter months. If you are playing with the idea of visiting the Belvedere, take trams 92 or 96 from Potsdam Central Station or Potsdam City Centre bound for Kirschallee and get off at Puschkinallee or Am Schragen. While there, you can easily combine your visit with a stroll to the Dutch Quarter or a visit to the Russian Colony Alexandrowka where you will also find a pretty Russian Orthodox Church. Find here more information on the Belvedere on the Pfingstberg.